Its getting real hot out here, so hot that I barely want to leave the apartment. So when I'm basking in my cool air conditioned igloo, I like to prepare my favorite summer lunch — a mountain of chunky chilled egg salad on top of sourdough toast. It's simple and satisfying. The secret to this salad is one special ingredient. Are you ready? You sure? Ok, ok. It's avocado! It provides kind of a duo of textures. The density from the egg yolk and the buttery soft avocado sing in this delicious salad. I also add finely chopped red onion, green onions, and a bit of dijon mustard and mayonnaise. What's your favorite summer lunch/snack? 1 Peel hard boiled eggs and place in a medium bowl. With a back of a fork, smash the eggs so they break apart but are still chunky and have some whole parts. Be careful not to over smash the eggs. 2 Score the inside of the avocado half into cubes and scoop out with a spoon into the bowl. 3 In a separate bowl, prepare the dijon/mayo mixture. 4 Gently fold the avocado, chopped red onion, green onion, and the dijon/mayo into the eggs. Serve with toasted bread. The blue plate in the above photo is a recent thrifty find from a local thrift store. I love the octagonal shape and dotted detail around the edges, and of course the color! I will try and point out my thrifty finds in my photos more often. *Don't forget to submit your BSI: Feta recipe. Deadline is Sunday, July 12. Thos salad looks and sounds good! A nice cmbo! Your egg salad sounds wonderful. Love the addition of the avocado also. Dijon always is pleasant too!! Lovely. Avocado?! Really? I've done egg salads after egg salads but I've never tried avocado in it. This is something I'll try on my next egg salad. I fill fight it out with you. I think MY egg salad is the best, with mayo, pickle relish and a bit of brown mustard. But I do love your addition of avocado in my favorite lunch sandwich! Forgot to comment on your thrifty find. The color and detail on the plate pop in the photo. What an interesting combination...I love egg salad and avocado, can't wait to try this out! Hope you're having a wonderful week!! Zoe, the salad looks so lovely. I adore avocado. I love the dijon and the avocado!! I just made egg salad yesterday for lunch! It is definitely one of my favorite lunches to prepare. I love the addition of avocado in this recipe, I had never thought about that before. I will definitely have to give it a try. i love a big, local summer salad with bragg's salad dressing for my summer lunches. if i have some left over grains or pasta from the night before i'll toss those on. i always top with local feta! I've actually never made egg salad before, but yours looks delicious! I love the combination of hard boiled eggs and avocado. Never thought of adding avocado... but it is definitely an egg salad recipe that I'm going to try! Off to update my shopping list. Can't wait to try it. Like the blue plate too. A thrift store might be the perfect place to look for interesting serving dishes. Never thought of that! This sounds so good with avocado - so creamy and buttery. I like a huge loaded salad with a big bowl of cold fruit to keep me cool. There are a lot of egg salad recipes out there but I think yours actually made me daydream. That soft glow upon the heap of egg salad, with a gentle blur in the background (bread! bread!)... oh my. Plus I love anything that has avocado in it. Great touch! This egg salad looks just delicious! I especially like the addition of the avocado. I know I sound like a broken record but, as always, great photography. You should really think about posting a photog entry one day. Wow.. this is an egg salad... I've only had egg in a potato salad.. but think this combo would be fantastic! thanks for the recipe. I haven't had egg salad in much too long. I love the addition of the avocado! This looks irresistable! I love the idea of the avocado in there. I love egg salad but have never thought to add avocado - what a great idea. My favorite summer treat is a BLT with avocado. Mmm good. The thing that usually keeps me away from egg salad is the mayo but the avocado gets around that! What a great idea. I can see how avocado would be great in this! 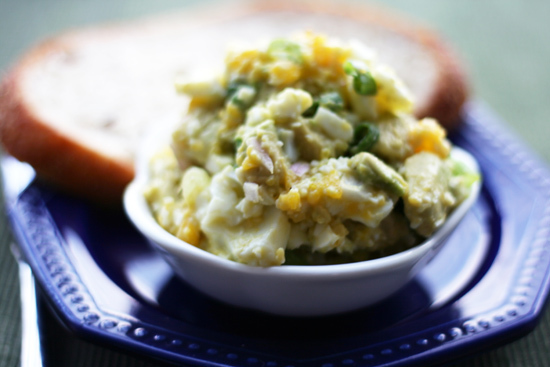 This really does look like the best egg salad ever:) I can't wait to try it!!! I've never thought about putting avocado in egg salad before - sounds delicious! Sort of like.... guacamole and egg salad mixed... Can't wait to try it out, thanks Zoe! I like the sound of using creamy avocado in an egg salad! Oh my! Just found your site through Tastespotting and have added it to my feed reader. I have avocados that are just right, and I'm headed to the grocery store to buy eggs. I look forward to cooking my way through your website. I have totally been craving egg salad, but didn't have a recipe for it. This looks yummy! I would never have thought of avocado in egg salad before - fantastic!! egg salad is one of the few things I don't like. But my husband adores it--next time I make it I might add a like of the green stuff. vat a perfect combo with avocado and eggs.. yummmmmmmmmm!!!! !